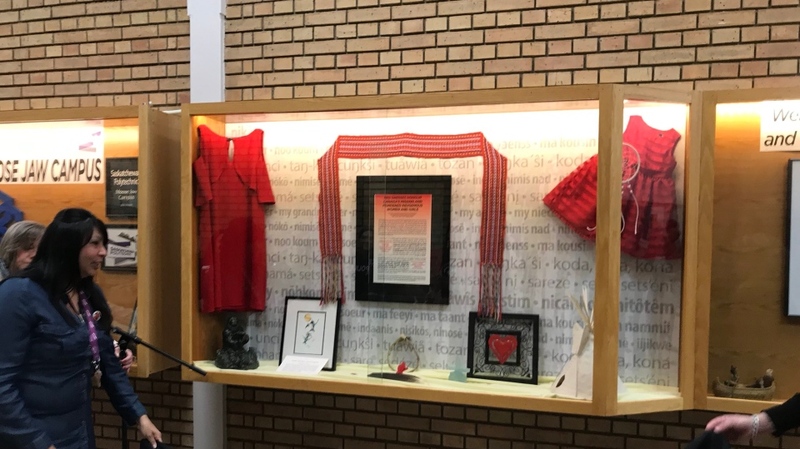 A permanent display in honour of Missing and Murdered Indigenous Women and Girls was unveiled at Saskatchewan Polytech’s Moose Jaw campus. The display consists of two red dresses, which have bene used in the past to honour MMIWG. According to some Dakota beliefs, the colour is sacred and is the only one spirits can see. The goal is the spirits of these women will see the dresses and know that they will not be forgotten. "This is to bring about public awareness and attention. We're creating spaces for indigenous women to be successful in post-secondary,” Indigenous Strategy Coordinator Deanna Speidel said. "An understanding of what has happened, and a hope that it will stop happening,” Indigenous Student Advisor Rosemary Zaba Stewart said. "Each of these lives is important and we want to create both the visibility and the opportunity for people to reflect on this,” Associate Vice President of Student Services Tobi Strohan said. “Guided by the principles of reconciliation, Sask Polytech continues to look for opportunities to holistically integrate Indigenous ways of knowing, teaching and learning into our practices, procedures and services,” Speidel said. A permanent display in honour of Missing and Murdered Indigenous Women and Girls at Moose Jaw Polytech.